Here’s a list of NYC restaurants with an international flair, that you’ll enjoy this Valentine’s Day. What’s more romantic than heart-shaped Tartare? Upscale Japanese restaurant, Koi SoHo (246 Spring St) will be offering special menu items, including wagyu beef flown in from Japan the morning of February 14. 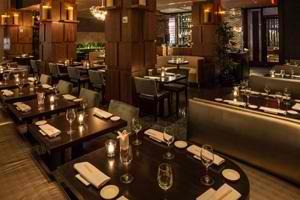 Romantic menu options include a Heart Shaped Tartare of Yellowtail & Salmon ($18), East & West Coast Oysters with a ponzu mignonette (3/ $18), Japanese Wagyu Striploin with wagyu fried rice ($42), and a Chocolate & Strawberry Napolean ($12). 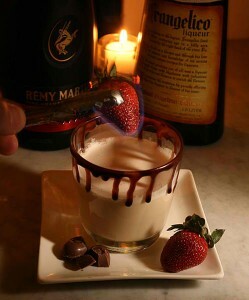 A French Valentine’s Day can be found at Chef Francois Payard’s FP Patisserie (1293 Third Ave). Course options for the three-course pre-fixe include Housemade Fois Gras Terrine with roasted pear and apple chutney; Seared Sesame Tuna with shaved cucumber and wasabi dressing; Braised Short Rib with black truffle polenta and glazed baby carrots; honey soy glazed Chilean sea bass; and fresh vanilla bean mascarpone with raspberry rose petal jam, vanilla bean pound cake and vanilla bavarois. $55/person. 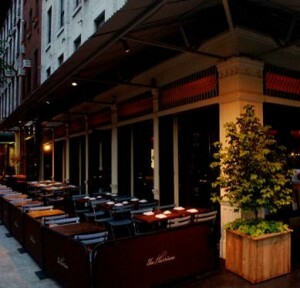 New American food can be found at Jimmy Bradley’s iconic Tribeca restaurant, The Harrison (355 Greenwich St). 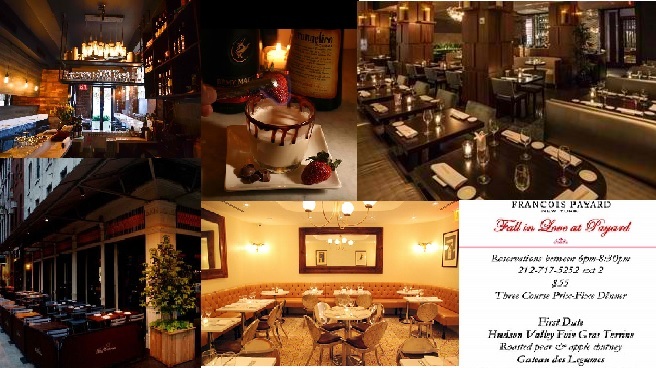 A romantic candlelit dining room with views of the Hudson is perfect for couples this Valentine’s Day. Dishes include East Coast Oyster with blood orange mignonette; Squid Ink Gnocchi with pickled chili, seared calamari and saffron cream; Colorado Lamb with homemade muerguez and crispy Brussels sprouts; and Ribollita Risotto with winter vegetables, parmesan and truffles. Pastry chef Colleen Grapes finishes the meal with her sweet creations such as Chocolate Carmel Tart with strawberry-balsamic swirl ice cream and gingered almonds. 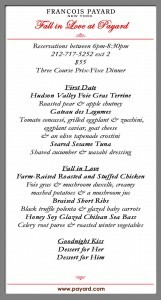 Prix Fixe menu for $75/person. Romantic West Village Mediterranean restaurant Barrio 47 (47 8th Ave) will serve a prix-fixe menu with options including Yellowtail Tartare with jalapeño, mango, and sweet Corn; lobster ravioli with ricotta salata, fresh basil and red watercress; dry rubbed Wagyu beef with artichoke purée and tomato jam; morel mushrooms risotto with asparagus, white Truffles and Parmigiano Reggiano; and chocolate lava cake and white chocolate dipped strawberries to share. $85/person. 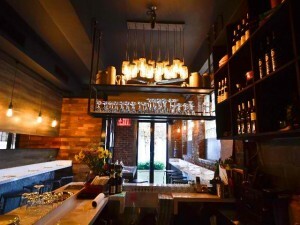 For a real fusion experience visit French modernist restaurant featuring elements of Spanish and Asian cooking tradition, Baoburg (126 North 6th St, Brooklyn). Chef Bao Bao has created two pre-fixe menus The For Her menu will feature fried goat cheese croquets with lavender infused honey and fleur de sel; grilled shrimp with avocado salad with champagne dressing; pan-seared monk fish and poached in butter lemongrass cream sauce with sauté maitake and oyster mushrooms with fancy tomatoes; and red riding hood velvet cheese cake served with chocolate streusel and meringue and vanilla ice-cream. The For Him menu includes Thai-style chicken empanadas; roasted kabocha soup with toasted pine nuts and cream fraiche; hanger steak in a savory tartlet shell with fried quail egg, caramelized pearl onions, mashed potatoes and chili basil gravy sauce; and mini churros with dark chocolate ganache. $45/person through February 15th.